The Red Feather Crew spent this work week car camping. 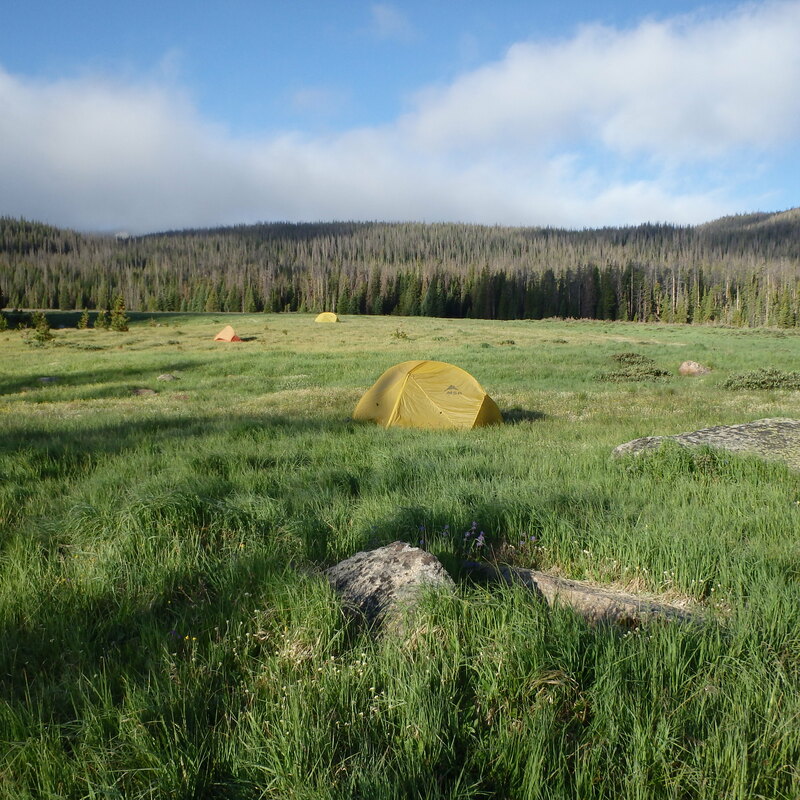 Having set up camp in a beautiful meadow thriving with nonthreatening wildlife, with the exceptional male deer, the crew set out to explore and maintain Trap Park, Corral Creek, Big South, Peterson Lake, and Mt. Neota trails. Work this week included building and clearing out many drains, rerouting water off the trail, and bucking out a multitude of trees ranging from massive to the generic “just big enough to use a corona.” Furthermore, trail work involved uncluttering the trail corridor employing loppers, coronas, and the new favorite ‘baby’ hand axe and constructing cairns in order to establish the trail in perplexing locations. When not working, the crew spent time chatting and joking next to the fire, prepping delicious group dinners, observing the wildlife, and preparing for the following day. In addition to the off-work tomfoolery and concentrated work effort, Red Feather spent the week engaging in an all-out war with the immense swarms of mosquitoes inhabiting the Comanche Peaks. The skirmish resulted in a sad but utterly inevitable defeat of the beloved trail crew, however they were able to take hundreds to thousands of the mosquitos’ forces down with them. 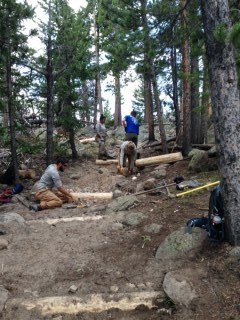 The Boulder Crew had a varied and exciting week of trail work. On Tuesday we spent the day with Michael starting at the Fourth of July Trailhead, one of the most popular trails in the Indian Peaks Wilderness due to the short hike to reach the continental divide. 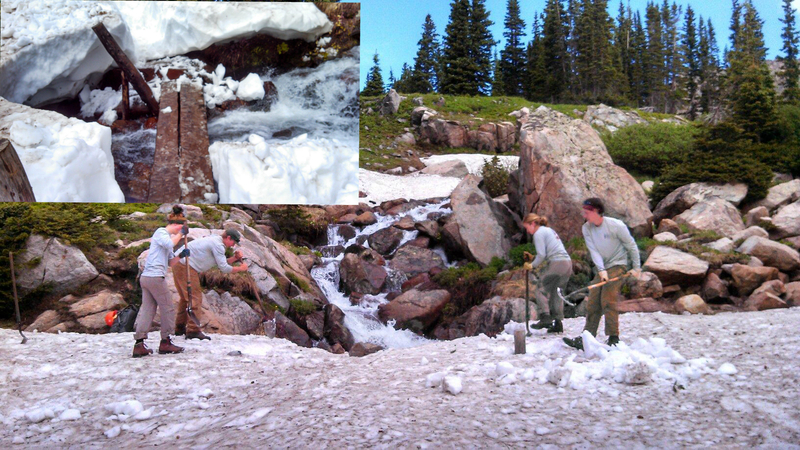 We completed numerous drains and started a wilderness bridge project that will be completed later in the season. Courtney got to use her crosscut saw skills to cut down two trees with Michael that were debarked and scored the next day for the bridge. On that next day, Jake, our crew leader, got to take charge! He led us back up the trail and beyond to reach the Arapaho Pass Trail. The view was incredible once we got above tree line. 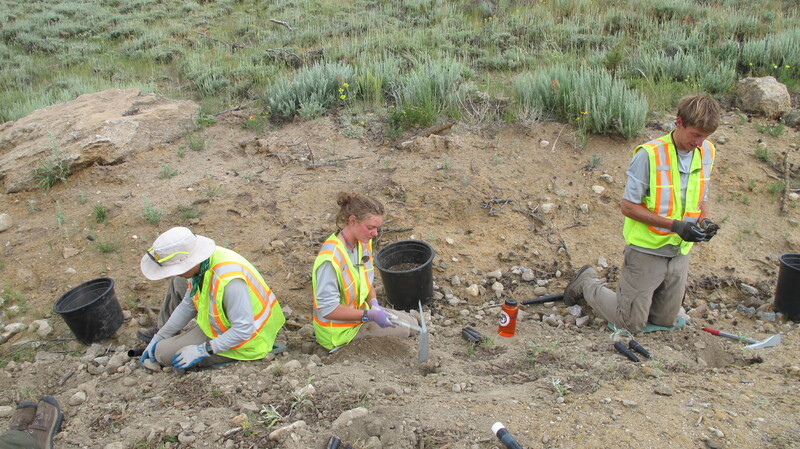 It was our first time working on alpine tundra! The rest of the week we spent the day with the district’s wilderness ranger, Mary. 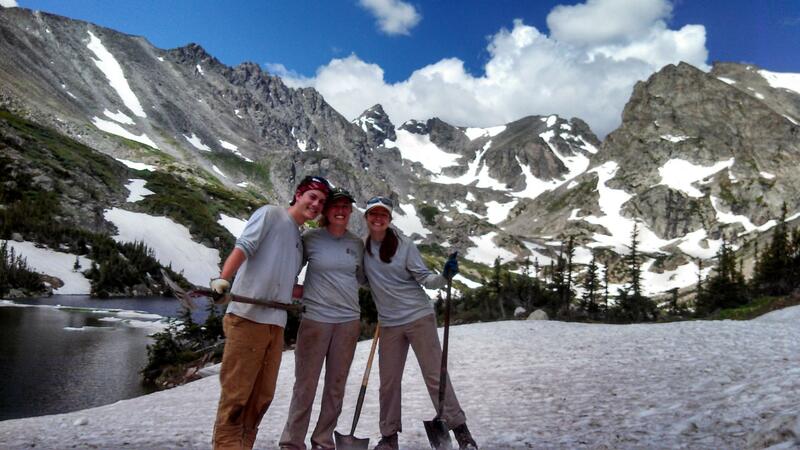 We worked in the Brainard Lake area from the Mitchell Lake Trailhead and Long Lake Trailhead. On the Mitchell Lake Trail we mainly shoveled snow off of the trail to minimize social trail development, but the most rewarding and fun project was to remove rocks from under a log bridge to stop the water from flowing over the top. This allowed more hikers to reach the next lake, Blue Lake. Many hikers, while waiting to cross the stream began to take photos of us working, we felt like celebrities. On Friday we hiked up to beautiful Lake Isabelle. Holly, Jake, Joey, FS Brian and I worked very carefully to uncover a wilderness bridge that had been hidden by snow to make sure hikers crossed the stream safely. Before we uncovered the manmade bridge, hikers had just been walking over the snow bridge that had formed over the creek and was rapidly thinning as the summer goes on. Needless to say, it was pretty dangerous. It was really satisfying to know that we had made the trail so much safer and to see people benefitting from our work! Trail work is not always so satisfying however. Before starting the project Mary informed us of all the hard, frustrating work she completed on the trail last season. Due to the increasing snowfall each year, the snowfield in the area has not been melting till mid-August causing huge social trail problems. Last year she spent over 1000 hours with volunteer groups to slash in up to 100 social trails. She was disappointed to see that much of her work proved ineffective due to the overwhelming amount of traffic. Later speaking with Michael about the issue, he stated that come mid-July there are up to 300 people on the trail each day! This got us thinking about the difficult balance between preserving the wilderness and allowing people to enjoy it. Together our crew uncovered hundreds of feet of trail that day and also did some revegetation work in an area along the lake. Overall, this week was a great one. We really enjoyed ourselves and felt our work was truly making a difference to further protect and preserve our wilderness lands. Joey, Holly, and Steph at Lake Isabelle. 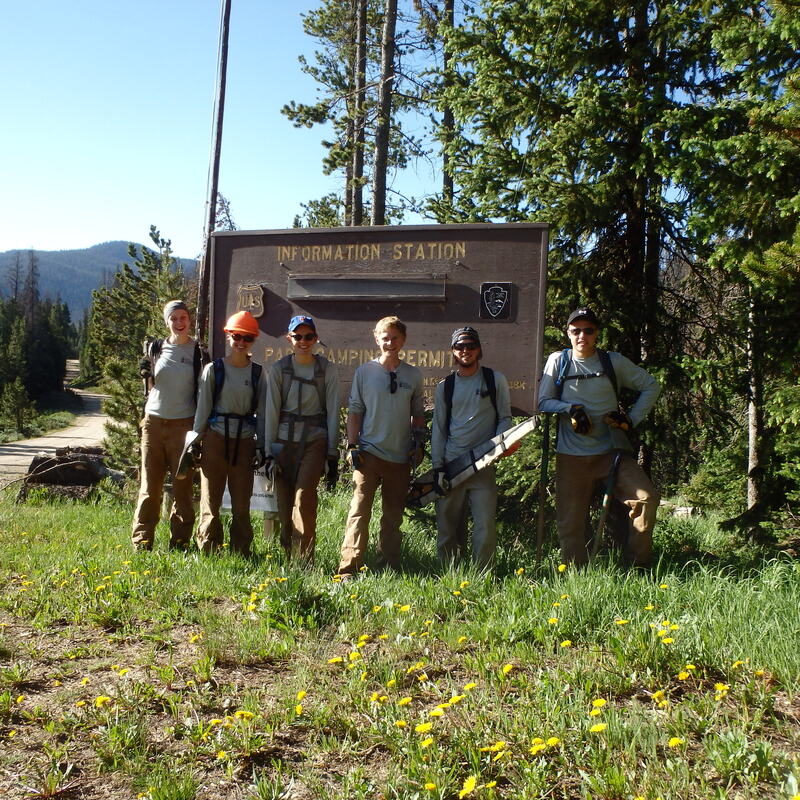 The Shadow Mountain Crew continued to hone their chainsaw skills this week by creating a quarter-mile reroute on the Soda Pass trail just outside of Grand Lake. The old off-highway vehicle trail veered through a low swampy area, with erosion making it difficult for ATVs and dirt bikes to pass through. 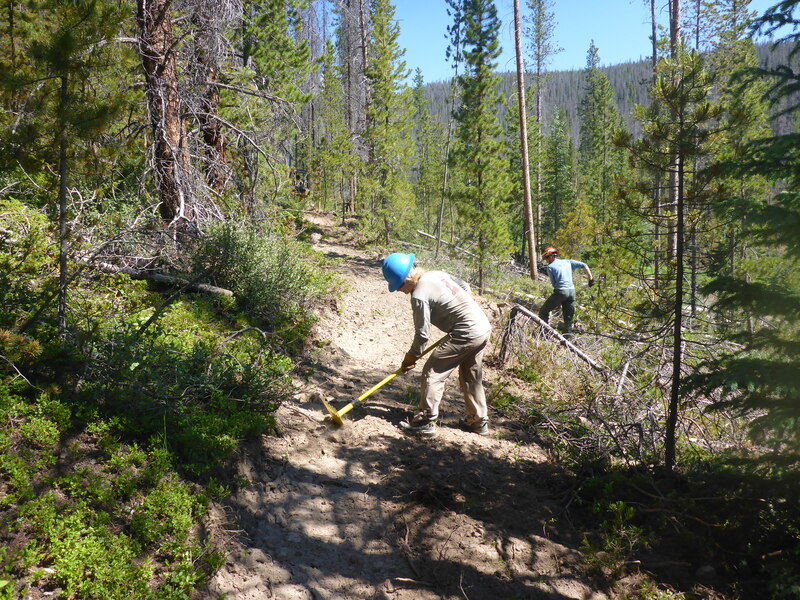 With the help of the Shadow crew, a few trusty forest service workers, and a bulldozer, a new trail was cleared uphill of the old trail in just four fun-filled days of trail work. Wednesday was spent using chainsaws to clear the path of the new trail by felling trees and bucking existing logs in the way of the new trail. 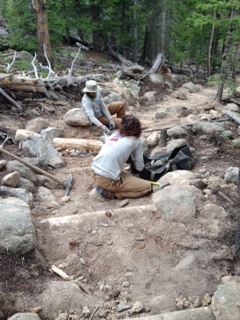 On Thursday, the crew used hand tools to establish tread on the newly bulldozed path. 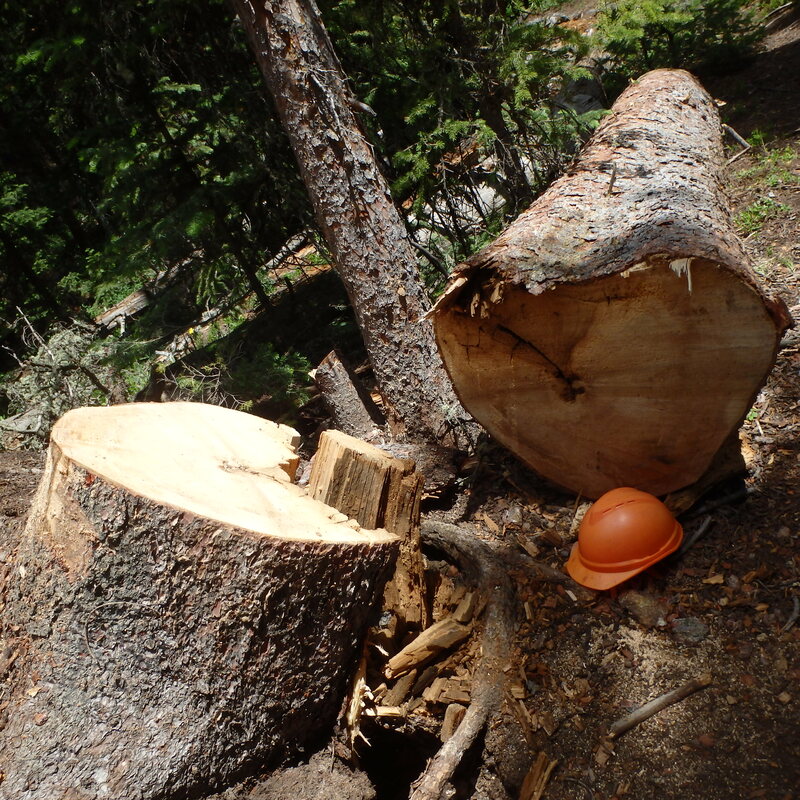 For Friday’s work, the crew switched off felling hazard trees near the new trail and decommissioning the old trail. To wrap up the week, Saturday was a day of finishing off the re-routed trail with tamping as well as re-vegetating the old trail in order to finalize the Soda Pass reroute. It was a tough week of work, but Shadow Mountain crew’s high spirits can’t be felled – the crew made the best of the trail days by having races up the hill to the worksite with tools and packs, critiquing Lewis’s eating style, and jamming out to Beyoncé in the Forest Service vehicle. 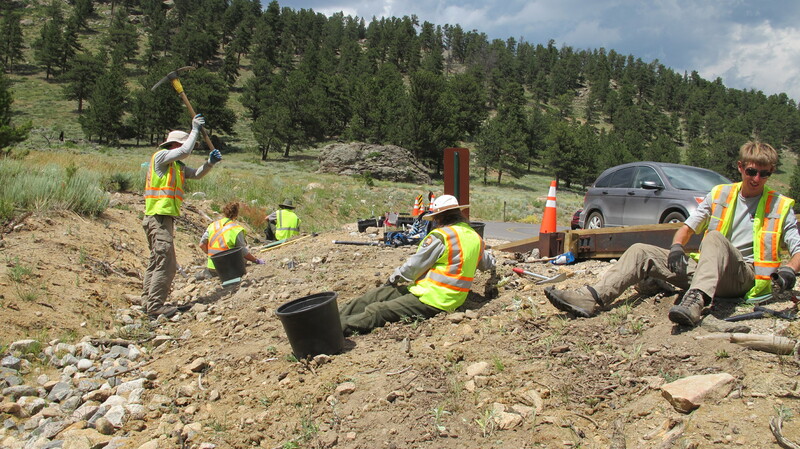 The Estes Crew working with Resource Management started this week watering the restoration areas off of the side of Bear Lake Road. These are the areas that had been torn up by the construction of the new road. The areas we water are covered in hydro seed, a type of seed that grows into a variety of native pants and absorbs water well. The rest of that Monday we spent planting at Moraine Park. Tuesday we continued planting at Moraine park for the entire day. 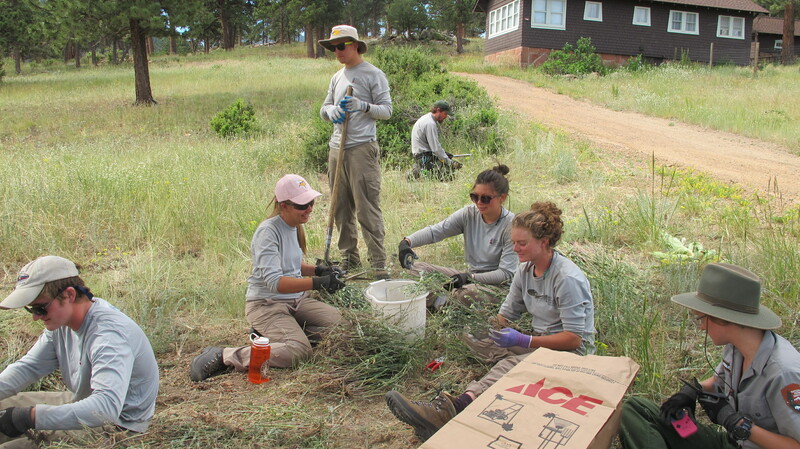 On Wednesday we spent some time with the invasive plants crew removing weeds from behind the trails shop. The remainder of that day was spent planting at Moraine and Howell park. We finished up the week on Thursday power washing styrofoam plant containers to be recycled and also organizing pots. That afternoon we joined in on what NPS calls a round table meeting where we discussed the shifting of norms and policies in the park. Restoring the Hollowell Park Curve. 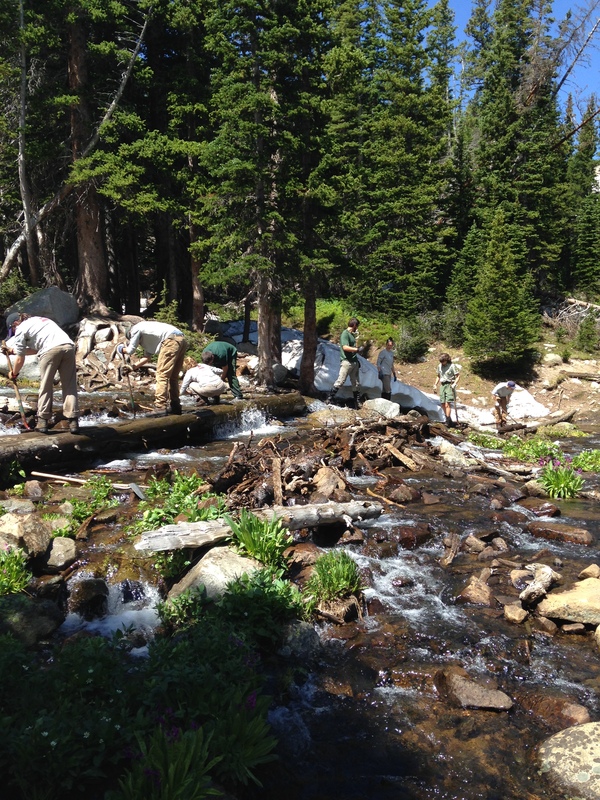 The Rawah Crew focused this week on the central section of the Rawah Wilderness Area. 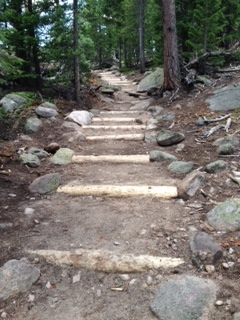 This sent them out on the Rawah, Link, and Medicine Bow Trails. Along these trails they completed 20 miles of log outs with a grand total of 131 trees cut with diameters up to 32 inches. Additionally, they completed 100 feet of corridor maintenance. 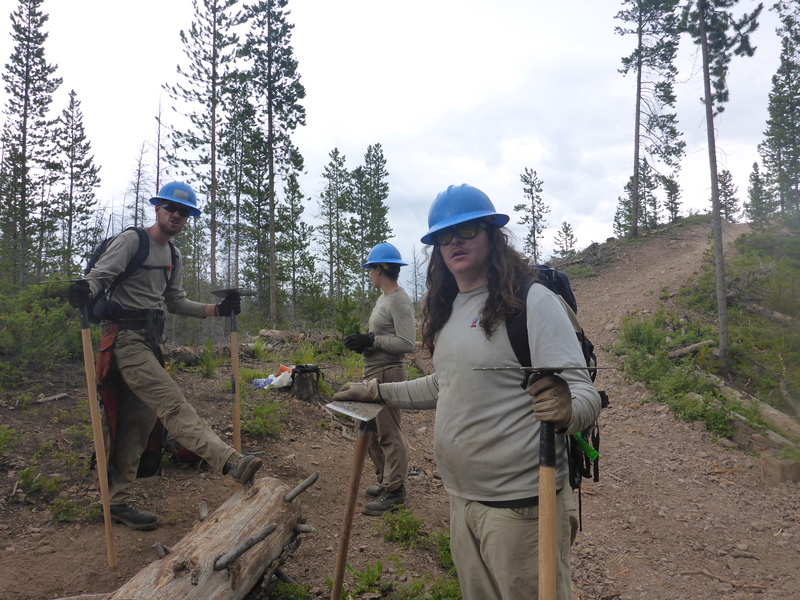 Our other Estes Crew, who spent their last week with trails, continued their project of building 60+ log checks a mile and a half up the Sandbeach Lake Trail in Wild Basin. We had completed 39 at the end of the day Thursday, leaving the rest for Tom’s crew to complete next week when we trade them and start our restoration duties. This was our first project as a crew and everyone learned a good amount of new skills and are now self sufficient at building log checks, start to finish, including identifying areas that could benefit from installing log checks. We worked through some frustrating times as a crew (moving and attempting to install 7 different rocks in one spot is very frustrating and takes 7 hours) but overall had a good time.